Denim pieces are, without a doubt, timeless closet staples that no one should ever be without. Denim button-down shirts, to the perfect-fitting blue jeans, to the quintessential summer item-- the denim skirt, every guy and gal should have at least one in their closet. Denim skirts have become my very own personal style staple-- banking on the idea that I can pair them with practically anything. I have a few denim skirts in light and dark washes but none of the distressed kind so when I found this distressed and patched Next Jeans A-line skirt, I just had to get it! I am not the biggest fan of patches but the coffee patch is just so hard to pass up on! Besides, this reminds me so much of my sister who loves patches like how I love my coffee. Totally unrelated but still. Haha! Am still not over the off-the-shoulder trend (bet you guys aren't too) so I paired this skirt with a crisp white top to offset the already "busy" patches of the skirt. And because this was an afternoon of running a bajillion errands with the mister, opted to wear pointy flats for comfort. Throwing in my favorite pompom bag because Summer is forever-- nvm the puddle in the background from the rain shower earlier. Haha! So how do you find this casual chic take on the distressed denim skirt? 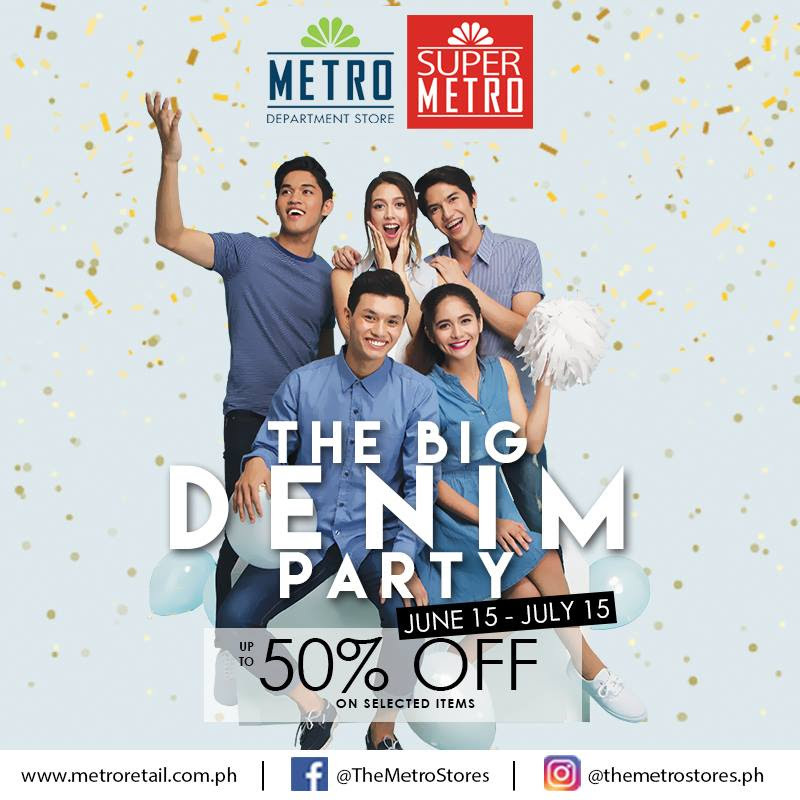 Still not over updating my denim collection and if you're trying to update yours too, catch The Big Denim Party 2017 at any Metro Department Store and prepare to hoard denim pieces on discount of up to 50% off on selected items!